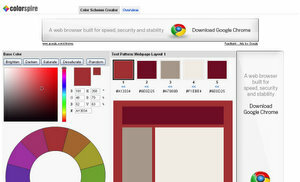 Colorspire is a cool tool that helps you select a color scheme for a website project. The tool has a flexible color picker and color wheel, that can be used to find analogous colors, complementary colors, triad or tertiary colors that will match your base color. The results are immediately displayed on a webpage layout, which could be used as a preview of how the webpage would look.